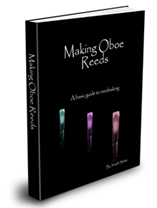 There are many places to buy oboe reed making supplies. Some of these places use the “old fashioned” way of placing an order and sending a check. Other places allow you to order online and pay with a credit card directly. The unfortunate thing about reed making supplies is how much they have gone up over the past few years. I remember in college I used to pay about $35 for a pound of oboe cane. Now, about 18 years later, it is over $100. Oh yes, the good old days! Below is a list of places that I have used over the past years that have a variety of tools, cane, etc. I can recommend them all very highly. Just click on their link to find out more about them. They give a very nice opening, and I have made many good reeds with these tubes. You also can’t beat the price!